We conduct a theoretical and practical comparison of two Ring-LWE-based, scale-invariant, leveled homomorphic encryption schemes – Fan and Vercauteren’s adaptation of BGV and the YASHE scheme proposed by Bos, Lauter, Loftus and Naehrig. In particular, we explain how to choose parameters to ensure correctness and security against lattice attacks. Our parameter selection improves the approach of van de Pol and Smart to choose parameters for schemes based on the Ring-LWE problem by using the BKZ-2.0 simulation algorithm. We implemented both encryption schemes in C++, using the arithmetic library FLINT, and compared them in practice to assess their respective strengths and weaknesses. 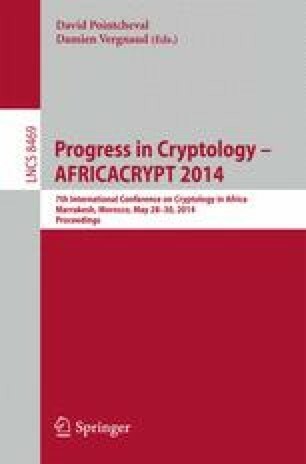 In particular, we performed a homomorphic evaluation of the lightweight block cipher SIMON. Combining block ciphers with homomorphic encryption allows to solve the gargantuan ciphertext expansion in cloud applications.